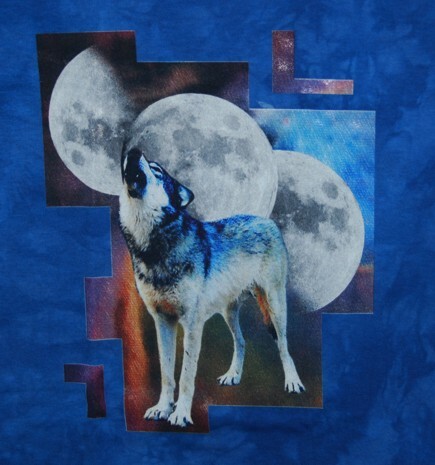 We are proud to introduce to you Wolf Howl Animal Preserve's Three Moon Wolf Shirt. It is a magical design created by one of our very own Wolf Nanny's, Alex Coyle. The howling Wolf in this powerful graphic is Chito. Be the first on your block to own this hand dyed beauty of a Wolf Shirt! Unleash the power of your inner Wolf and combine it with the force of 3 Moons. This Wolf t shirt was designed and printed at the Preserve. It is made with environmentally friendly inks and dyes. Machine wash warm and tumble dry medium.